Use tin foil and a hose to make a river in your backyard for your kids. Make an obstacle course out of pool noodles. Learn how here. Take paper dolls to another level with this fun idea. Putting playdough in balloons creates a whole new playdough experience. Cut sponges actually make great building blocks. 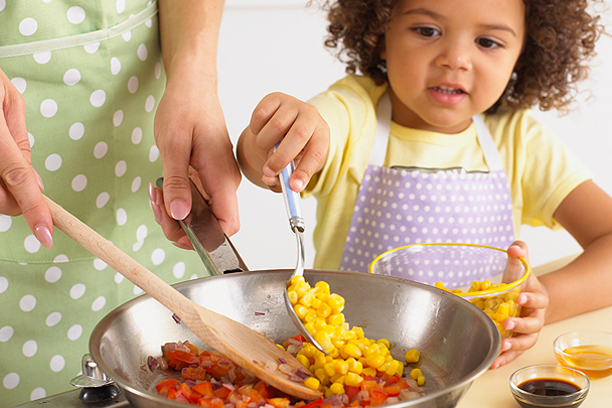 Start your kids’ love for cooking early, and let them help you in the kitchen. All you need is some burlap and yarn to have a sewing station for the younger kids. Have your kids race with straws and popcorn and other fun activities. All you need is some colored tape to make streets for your kids’ toy cars. Let your kids color their own shirts. Check out how.